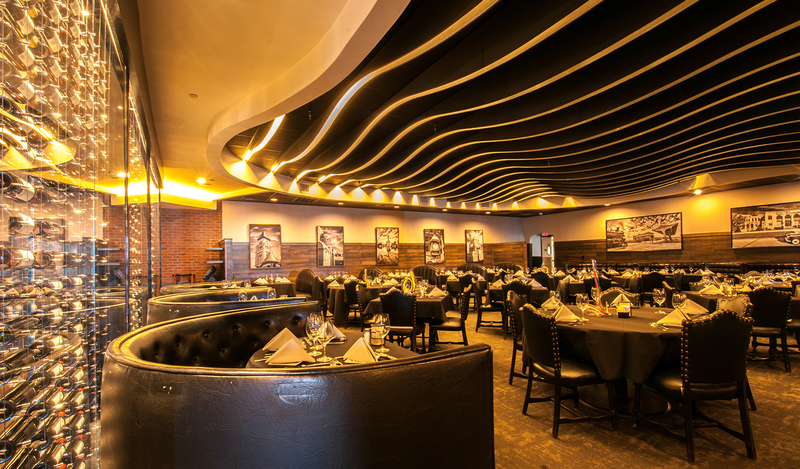 The Scotch and Sirloin Restaurant has been a Wichita standard for over 50 years. In its present location for over 21 years, the steak house had a tired old charm which was quickly becoming dated. The new owner wanted to modernize with new interiors that emphasized wine and not just scotch. The owner began serving wine in specially designed Austrian Riedel Crystal Mamba decanters. This was quickly becoming a trademark for the restaurant, so when challenged with the new opportunity to update the restaurant, the designers took note. The interior was rethought to reflect this new wine serving decanter. The entry was removed to allow for additional height. The decanter theme was emphasized in a new ceiling drop which winds its way across the ceiling and culminates into a spiral tail encompassing a new Chilhuly glass light fixture. This form has cove lighting which outlines its snake-like shape as it moves from the entry, between the bar and into the dining areas. The “S” forms in the curved ceiling which echoes the name of the restaurant. The dining areas present an undulating beamed ceiling with internal LED lighting that accent the soft curves of the ceiling. 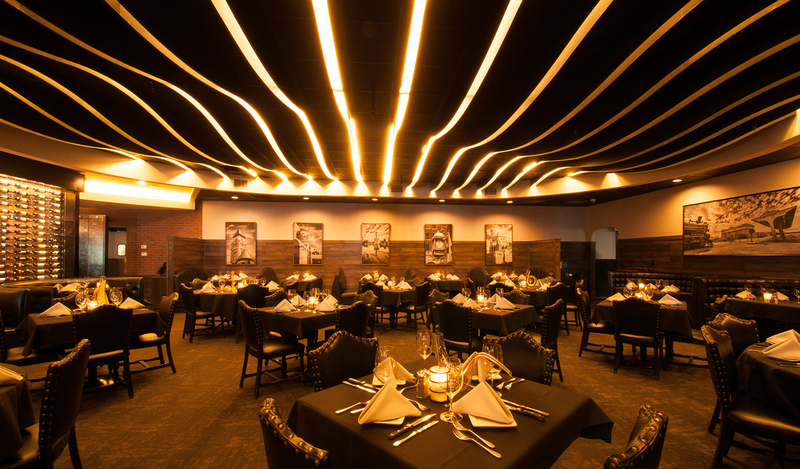 The repetition and variation of the curves provide a warm flow and calming atmosphere in the dining space. 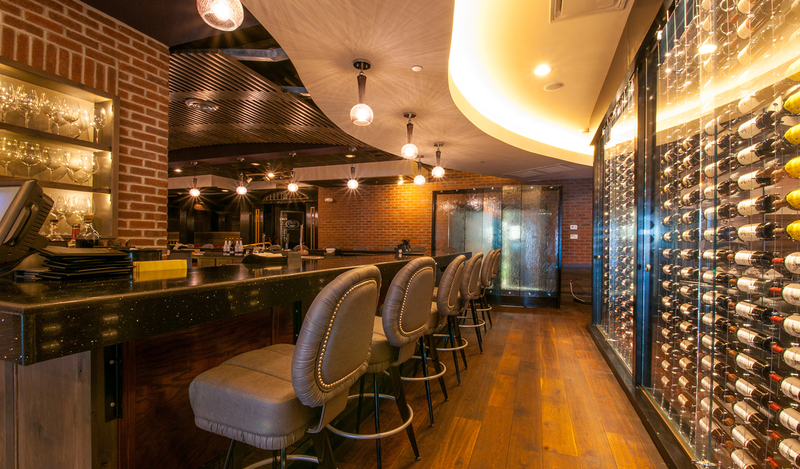 Brick accents at the entry are carried throughout the dining room and the bar. The brick is a unifying theme which connects the restaurant interior. 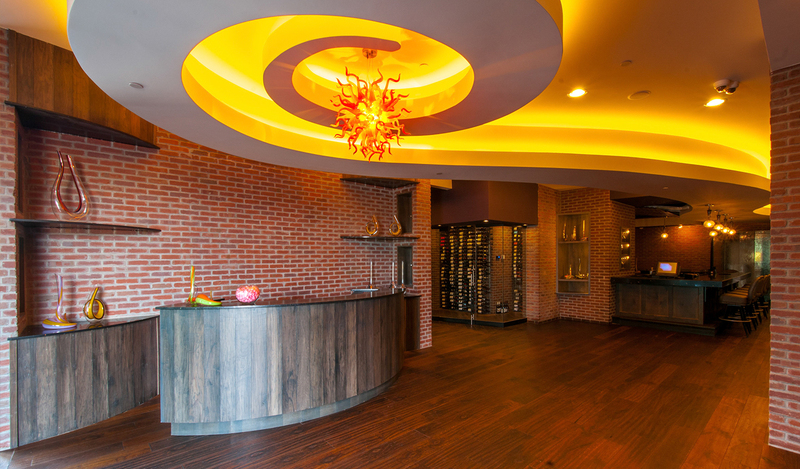 The primary feature of the interior is the new floor to ceiling floating wine display. The bottles are suspended in midair between glass panels by way of stainless steel cables. 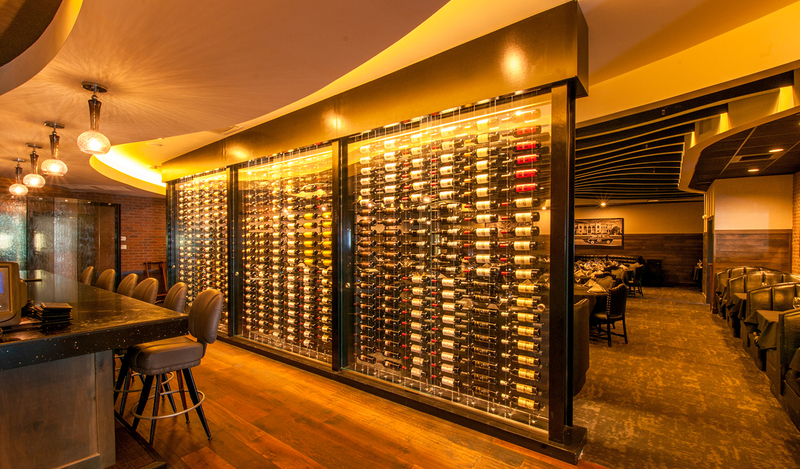 The wine display becomes the divider between the bar and the dining areas and is a key feature in both rooms. A real wood floor creates warmth of the space while wood accents and art are finished with a purposeful weathered grey color. The interiors have been well received by the customers who have enjoyed seeing this transformation from a tired old steak house to a modern venue for entertaining.